Roger Hahn approached life like a race—with passion and perseverance. Thus, when it came time for the beloved professor, also a fixture in the local running community, to hang up his sneakers, he did so with grace and dignity. Hahn was the consummate teacher, whether in the classroom, in the lab or on the track. 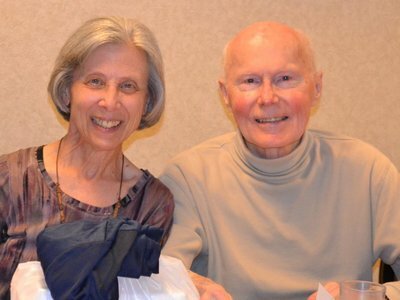 For more than 35 years, he taught organic and general chemistry in the College of Arts and Sciences (A&S) and advised countless graduate and undergraduate students. Not even “retirement,” which began in 2000, seemed to break his stride. Hahn just changed up his game. An associate professor emeritus of chemistry, he maintained an active research program until his death, often supporting various postdocs. Witness multiple articles he co-authored as recently as 2015. A&S Dean Karin Ruhlandt says Hahn left an indelible impression upon her in 1993, when she interviewed for a faculty position in the chemistry department. Delayed by a springtime snowstorm, an exhausted, sleep-deprived Ruhlandt thought she had bungled the interview. Then she met her future colleague. Indeed, science was in his blood. Born and raised in Cleveland, Ohio, Hahn attended nearby Oberlin College. No sooner had he earned a bachelor’s degree in chemistry than he found himself in the trenches of South Korea, serving as a smoke generator specialist for the U.S. Army’s Chemical Corps. Tasked with defending against chemical, biological, radiological and nuclear weapons, the corps stoked Hahn’s interest in organic chemistry. He eventually parlayed a Ph.D. from The Ohio State University into a prestigious National Institutes of Health Postdoctoral Fellowship. Hahn arrived at Syracuse in 1965, as the University was evolving into a research powerhouse. Now a husband and father, he wanted to hang out his shingle, play the long game. He set up shop in the Department of Chemistry then located in historic Bowne Hall. In those days, chemistry was a small department with a growing reputation. Along with organic, inorganic and physical chemistry, faculty engaged in interdisciplinary teaching and research. This collaborative ethos, which Hahn helped foster, culminated with the department’s move into the Life Sciences Complex in 2008. Hahn was enamored with the building blocks of organic synthesis. His work was rich and varied, finding applications in the development of pharmaceuticals, agrochemicals, pheromones and perfumes. Hahn applied this singlemindedness to other aspects of his job. A voracious reader, he regularly kept abreast of the latest research. Colleagues marveled at his ability to comprehend and retain scientific articles, while appearing to sprint through them. He was not an absent-minded professor—far from it, but he had his quirks. For instance, Hahn often fixed himself tea, only to leave it on the hallway water fountain. “The cup would stay there all day, while Roger sat in his office, indulging in the latest [scientific] literature,” Dietz adds. 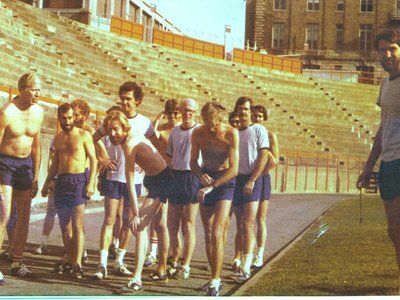 Roger Hahn (sixth from right) preparing to run in Syracuse’s now-defunct Archbold Stadium in 1978. When not grading papers or toiling in the lab, Hahn unwound by running. More than a sport, he considered it a way of life. Hahn began running at age 15, and, through grit and determination, kept at it until three months before his death. Hahn prided himself on being a charter member of the University’s Noontime Running League, which, for more than four decades, has organized weekly runs at Manley Field House. (Nick Wetter, former director of the University’s Department of Recreation Services, founded the league as the Faculty-Staff Joggers.) Hahn’s ability to inspire athletes of all ages and skill levels—a trait known as the “Roger Factor”—led to many winning teams, particularly during the 1990s and early 2000s. One of Hahn’s recruits was Steinbach, who says he was a “force of nature.” “Roger was a learned man, devoted to his field and his sport. He always stayed on top of my competitions, knowing the results and how to advise me,” explains the longtime captain of the Noontime Runners. She and McConnell will participate in a public memorial service for Hahn on Friday, Sept. 14, at 3 p.m. in Hendricks Chapel. 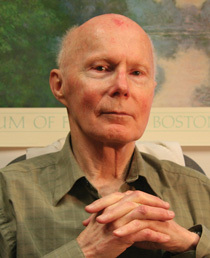 Stephen T. Murphy, professor emeritus of education and human development at the University of Southern Maine, used to run with Hahn in the 1980s and ’90s, when he taught at Syracuse. Murphy says Hahn was not just an excellent short-distance runner; he was a supportive training partner—one of the best. An avid outdoorsman, Hahn became interested in hiking in 1985, while honeymooning with his second wife, Estelle. They eventually became part of the Adirondack 46ers, a select group of people who have officially climbed the region’s 46 highest summits. Hahn also enjoyed listening to classical music, judging spelling bees and cheering on his beloved Syracuse men’s basketball team. More than anything, Hahn was a family man. Everything took a backseat to Estelle, as well as their six children and eight grandchildren. “Most of our conversations reverted back to his family. He loved talking about his children, but always made it a point to get to know the people important to me,” Dietz adds. Many of Hahn’s family members and friends plan to attend his memorial. One person who will not be there, however, is Steinbach, scheduled to compete in the 2018 World Masters Athletics Outdoor Championships in Malaga, Spain.